We’ve looked at speeding up Windows 8 with ReadyBoost as well as using it to improve Windows 7 performance. While this built-in Windows feature is useful and can help with speed, it’s always nice to have alternative solutions. We’ll look at five other programs for similar use below. Each of these programs function very similar to ReadyBoost in that they utilize free system memory to create virtual disk drives where files and/or applications can be launched from. This allows these objects to run from raw memory, providing better speed and performance than with a regular disk drive. Mount these virtual drives as if you’re using a USB device or other internal hard drive. Quickly add application files or the Windows TEMP folder location to a drive used by RAM Disk. 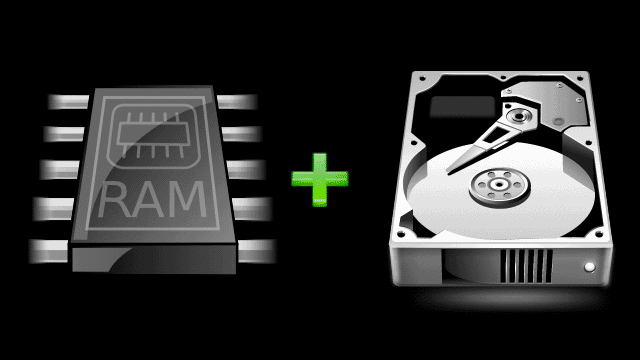 Any number of drives can be mounted to allow direct access to available memory. Set each drive to a certain RAM count to ensure you don’t go overboard and lock up the system. No RAM limit is imposed on 64-bit systems, while a 3.5 GB restriction is put in place for 32-bit systems. Easily see how many MB of memory is free to know what you can set the drives at. Primo Ramdisk comes in four editions: Standard, Professional, Ultimate, and Server. Choose a drive letter, disk size, and disk type to make a virtual drive from the system memory. Choose either a SCSI or direct-IO disk. The former works like a real drive while the latter is only logical but runs much faster. Ramdisk supports Invisible Memory to attempt to utilize even more physical RAM by grabbing memory the system is supposedly using elsewhere. This is a risky option and should be studied before attempting. 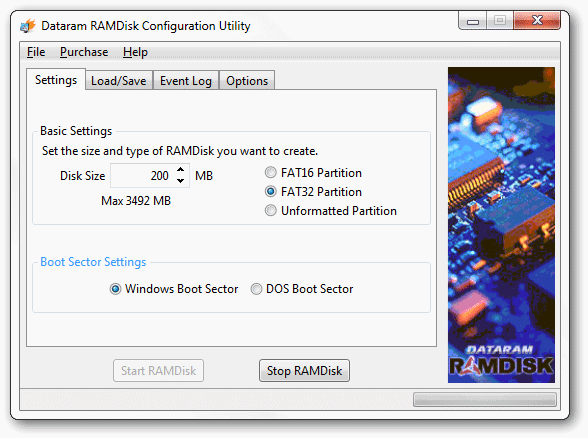 Use Dataram RAMDisk to set a disk size and partition type before starting the the virtual disk. Select either “FAT16” or “FAT32” to use the virtual drive as you would any other local or remote disk where files can be placed. While the free version isn’t equipped with greater disk sizes as the Personal or Commercial editions, setting up the disk and viewing log files about how it’s operating is very simple and straightforward. 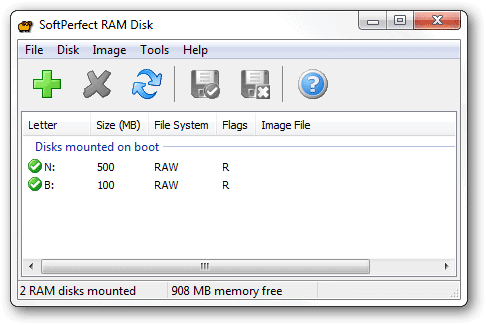 Use free RAM and disk space for performance boosting with eBoostr. Manually select devices and easily alter the cache sizes for each from an easy-to-use options window. Add applications to an Accelerated list to prioritize eBoostr’s functionally to work best with these programs. At the same time, frequently used programs are automatically tracked and pre-cached to reduce load delays and optimize performance. The trial version is only available for two hours after initial system boots. 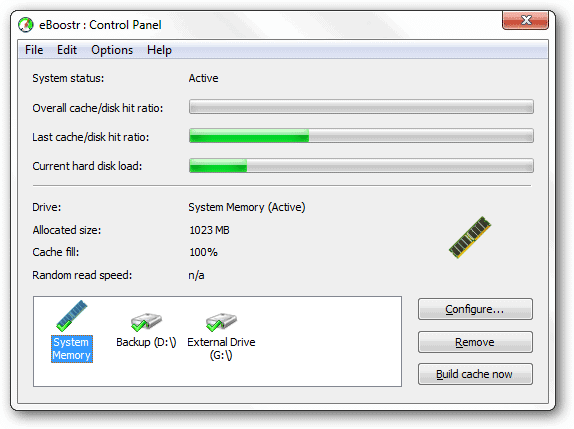 Setup SuperCache on any available drive, external or internal, to use available space as additional memory. 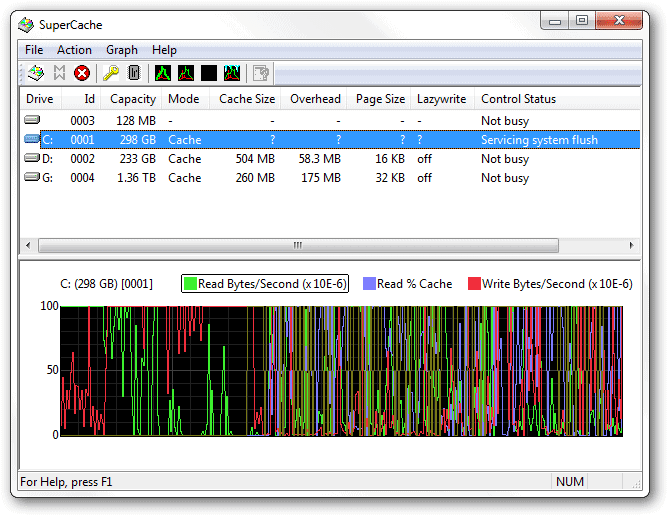 Any program that is identified in the background as one that’s used often, SuperCache will use RAM, not the drive, to to read the data to and from. This speeds up accessing and working with browsers or other common programs. An option for mirror mode is present that allows an entire disk volume to be mirrored in RAM, providing quick access when it comes to any file opening from a particular partition. While each of these programs offer nice features comparable to Windows ReadyBoost, they also differ in the slightest ways. I’ve ordered this list based on easy-of-use and functionality, so start from the top and try each of these out to see what works best for you. Maybe ReadyBoost is still your favorite method. Let us know what you think or if you’ve found another alternative we should include.